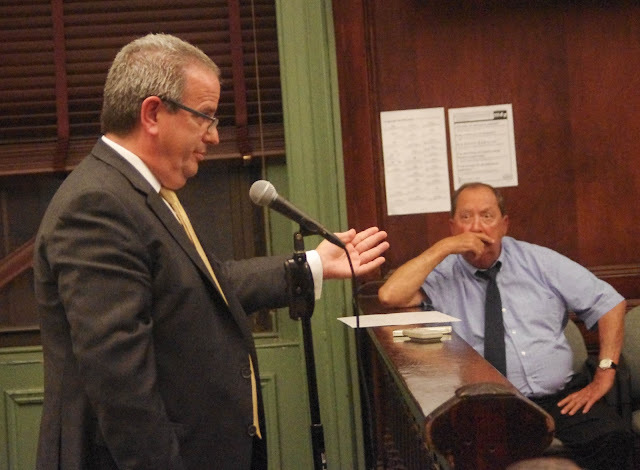 MSV: Horse Sense: Hoboken Watergate to trigger $9 million tax increase and investigation? Horse Sense: Hoboken Watergate to trigger $9 million tax increase and investigation? 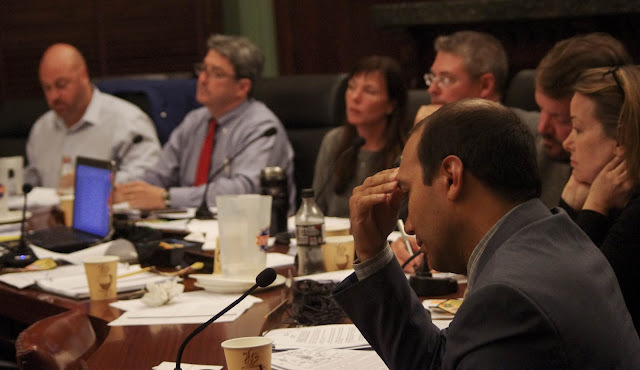 The revelations of $8.3 million in red ink owed to Suez, the contracted water vendor to the City of Hoboken came to light last night and the questions started coming fast and furious with the disclosure. Council members raised questions wondering what's next even with the lack of transparency from the mayor's administration on how the red ink accumulated over four years. Some of the council's questions point to a possible investigation by the NJ Department of Community Affairs. In his closing remarks, Councilman Peter Cunningham gravely wondered if such an investigation would cause Hoboken further harm. rejected the proposed contract renewal with Suez proposed by Mayor Zimmer. Back in 2009, the State took control over Hoboken's finances when the previous administration rang up similar red ink and kept the deficit running while withholding the truth from the City Council. Getting to the bottom of how the City of Hoboken's red ink deficit to Suez came to pass may not be so easy. A number of professionals spoke last night and none postulated a coherent response. Each sought to punt questions posed to them at the earliest opportunity. The City auditor Steve Wielkotz claimed ignorance on the entirety of the deficit until just the other day. Others pointed to awareness of the problem two months ago and another separately a year ago. Mayor Zimmer did not take questions from the City Council and sought the retirement of the deficit by obtaining approval with a new Suez contract where the deficit would be absorbed. learned of the $8.3 million dollar deficit owed to Suez, the water vendor to the city the other day. Another consultant admitted knowledge two months prior and the BA said one year ago. When did Mayor Zimmer know? The City Council not obtaining any answer on the deficit or details on the financial analysis of the Suez contract over months, balked at approving the mayor's contract proposal. City Council President Jen Giattino concluded the issue by removing it from the agenda seeing not a single council member willing to sponsor the mayor's memorandum of understanding to renew a contract with Suez. Additionally, some council members raised the idea of taking the Hoboken water contract out to bid. Speculation that Suez held the City of Hoboken over a barrel and the new contract while an improvement over the drastically bad current is thought far too favorable to the vendor. Some believe the lack of open bidding for the new contract was tied to the administration's efforts to bury the four years running deficit and roll it into another Suez contract. The council wasn't buying. Attempts to blame the City Council for the actions of the mayor's administration aren't likely to gain much traction with the public. Hoboken is not "stuck" with the existing bad contract. It needs to look at all remedies to get the best outcome. Unfortunately, the red ink accumulated in the last four years and unaccounted for by any of the financial professionals or the mayor may trigger a tax increase, a lawsuit or both. Mayor Zimmer has a lot of explaining to do. To this point, she's not inclined to do so. None of it however looks favorable to a Zimmer third term under Councilman Ravi Bhalla.